I mentioned this briefly when I posted about the Jan. 28th meeting of the Old Timer's League. Wouldn't you know it, within 24 hours, I see this post on Psychology (Psychosis?) of a 'Wing Player by Sons of Thunder. That's what some people call a sign. You see, I have the best job in the world... at least for me. And I tell people all the time that I hope that they too have an opportunity in their life to have the job they really want. I think everyone should be able to do what they want for a living. Everyone should at least be able to give it a go so they have no regrets in the end. But this isn't about me being a life coach, it's about 40k. What I'm saying is this applies to 40k armies. Everyone should have the chance to play the army they want to play. And everyone one of us have that one army where we say to ourselves, "Man if I had the chance, I would build..."
I play Deathwing and it's for all the reasons listed in Sons of Thunder's post. It's the army I knew I always wanted to play the moment I saw it. Of course I've spent my "gaming life" playing other armies like Black Templars, Eldar, regular Space Marines, etc., but none of those have given me the pleasure I get when I play my Deathwing. You'll actually be seeing more of my Eldar in the coming weeks as I need to finish the force. You see, I managed to get a game in with them the other night and I knew right about the end of Turn 1 that they weren't for me. So I sold them. For me, there's no point in having other armies, I'm not going to play them anyway. A while ago, I built a "counts as" Lustwing force that was all footsloggers. It was my first attempt at a Deathwing force. It had too many bodies for me. The army was fun, but I really wanted less models than the 26 it had. Not epic enough. The odds against me weren't high enough yet. Now I'm down to 15 total models with my current army composition. I'm actually trying to figure out ways to make it smaller too. It's the challenge for me. I've taken the army that I love the background to and built a force that fits with it and I've made it fairly difficult to use in the end (deliberately). If I look back, I compare it to when I used to play Magic way back when and I ran a multi-colored deck with only two creatures (two Serra Angels) and it did amazingly well once I finally learned how to play it. FoxPhoenix 40k recently posted about developing simple strategies for your army the other day and while I don't agree with all of his points, there are some really good ones in there. It's not about the list, it's how you play it. Gamers World posted the other day about taking sub-par lists and trying those out next time you go gaming. This hobby costs a good amount of money to get involved in... why not make your investment in something you really want to spend your time building, painting and playing? Fortunately, it only took me a few years to figure that one out. Great article, man. When I was younger, I fell into the trap of wanting to win. Not all codexes could win at GTs, so I wanted an army that could win it all!!!! Then I realized I wasn't having any fun playing 40k. I left the 40k and played everything else. Confrontation (RIP), Warmachine, etc. I had a blast. It took some time but I realized that I love playing small armies. Armies that demand unforgiving tactics. I played the Devourers of Vil-Tis in Confrontation and was just having the time of my life. When I looked at 40k again, I thought, "To hell with winning, I want to have some fun!" I still win, plenty of times, actually. But I enjoy, and learn from, my losses nearly as much. 5] I don't have much storage space. I love them. I love the quiet, despairing pessimism of BS3; I love seeing the massed ranks and - most of all - on a fundamentally human level it's great when they win. Particularly the time when they wiped out 1500pts of marines to a man! I've always felt that if a background and look appeals to you, you'll enjoy gaming with it far more than a force made simply for winning. I made my own space marine chapter, and although I never finished painting it (they're still about somewhere waiting for my decade long exodus of gaming to end) I had so many ideas about the history of them and where I wanted to take them that every game gave me ideas and helped reinforce how much my own imagination made games more fun. whether i won or lost! 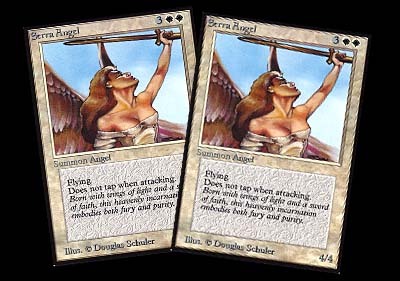 Ok, how do we find more about this Serra Angel deck? It's been a long time since I've played MtG, but that deck sounds truly odd. Explain plz, thx. I could not agree with you more. Once upon a time, I made a similar post. I agree that you can enjoy playing an army, but there is nothing as fun as finding THAT army. For me that used to be Tyranids. However, now with the rules changes, I find that I do not have as much fun playing them, so I sold the army. It was not because they were not strong enough, or powerful enough, but just the opposite. The Hormagaunts that wound on a 4+ for 8 points and the reduced amount of shooting means they were no longer the army I liked to play. Currently, I have three armies that I am working on assembling, I have high hopes for several of them. I tend to pick armies that no one in my area is playing, because I like an underdog --- oh, and Bugs are no longer that army. Once I get my CSM and Daemon armies assembled, we will see.....hopefully one of them will be THAT army! It's an article that's been simmering in my brain, and when I read yours, I figured it was time to finally write mine down as well. More of that advice I give to newer players, but don't always think to write a post about. Funny thing Ron... 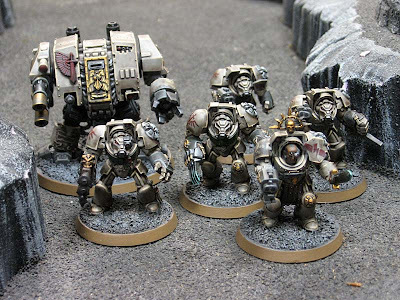 Here I was doing a bit of reading up on Deathwing (since I'm pulling together a BA 1st company) and I linked to this post... but I hadn't even noticed that you had linked over to my blog in this post! This isn't going to cause a space-time-continuum collapse will it? As an avid and relatively new Deathwing player with an embarrassing 90% losses in over 20 games... I can relate to the idea of being in love with an army. I personally enjoy it most when two well painted armies come to terms on the field.... it is like filming a movie. I prefer to find players that play for fun, even if competitively, but don't always need to use WAAC lists. I've been following your site for a while, this was an article I couldn't miss commenting on though. By the way... I wasn't able to checkout FoxPhoenix's link, it said I had to be invited.. not a big deal though. 40knjny: It takes time to learn how to play Deathwing. They are up there with Grey Knights I think when it comes to learning how to use them correctly. And by correctly, I mean well enough to win consistently. They are an unforgiving army... just one tiny mistake means the difference between a win and a loss. As for FoxPhoenix's blog,he had to go "invitational" since he was having some issues with his site overall. Ron, I guess your comments inspired me.. I went to my first tournament as a player (I've been an observer for 3), and ended up with 2 wins and a draw, at 1000 points. Part of it was luck, I went up against Chaos Khorne (with land raider), Witch hunters, and IG with two killer Medusas... and I didnt pair up vs Orks or Dark Eldar... who tend to table me for the most part. Take care, I'll continue to check the blog... thanks for keeping it fun. 40knjny: Good to hear you did well. Part of it is luck... the dice will always be there. But part of it is how you use your army. Some armies are harder to learn how to use effectively than others. some require certain tactics or methods to "work" best if you will. The real trick is figuring out how you like to play and then getting an army that matches that play style. Guard will never be an elite force just like Tau will never be a hand to hand combat army. Playing an army that you enjoy in the style you like to can be very fun to do. For me, that's Deathwing.